Christmas Gift Guide 2016: Panache’s pick of the kit! The holidays are upon us and there’s no better gift to give to your dedicated cyclist than new kit! Here is my gift guide to cycling kit that I would love to find under the tree or over the mantle – some racing and some casual gear. But it’s not all about me – it’s about you and your loved one! Hopefully this gives you some great ideas for Christmas surprises. 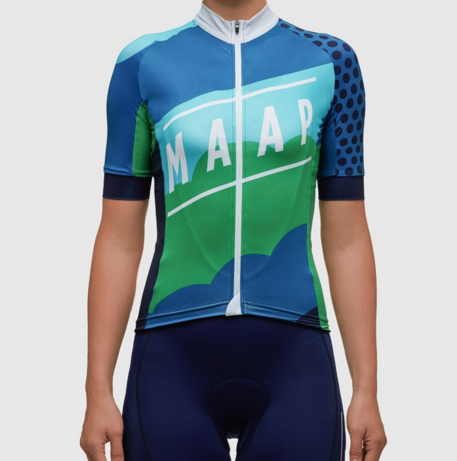 I visited Australia in October and was pleasantly surprised by the MAAP Brand that I found in many of the local shops. This is high quality clothing. The Divide Jersey is aero fit and features a premium singular lycra fabric, which is super durable. The sleeve hem is laser cut and features a 1cm thermo-taped internal silicone gripper. The body hem uses a half-elastic construction and the front hem is cropped to reduce the jersey bunching and uses a seamless welded construction which sits flat against the bib short. Materials aside, the Divide MOD jersey is just flat out good looking. I love the colour blocking and angular shapes with the little bit of polka pox! c£126.00; AUD$210; US$175 Free international delivery for orders over AUD$200. For more shipping details, see the website. The team at Panache is top notch. They are good people that make great clothing. I’m gaga for the polka dots and high-vis stripes of their Chapman short sleeve jersey. 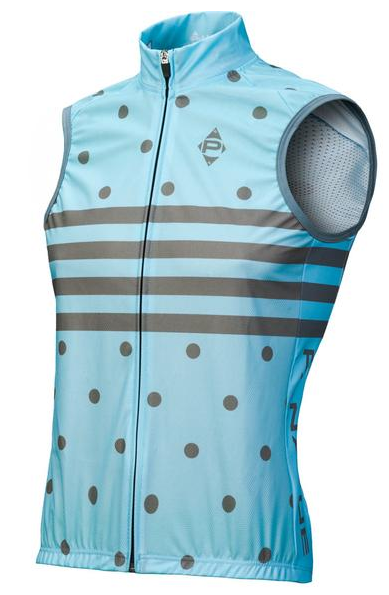 [Kitty here: I love the women’s Houndstooth 16 jersey and the Chapman wind vest.] Three rear pockets with stretch tech fabric has ample room for flat-kit, vest, and nutrition. This jersey features laser-cut arm bands with silicone gripper ink for no-slip comfort and aerodynamic profile. Another great feature is the two position zipper head allowing for one finger operation in open position and no slip in closed position. 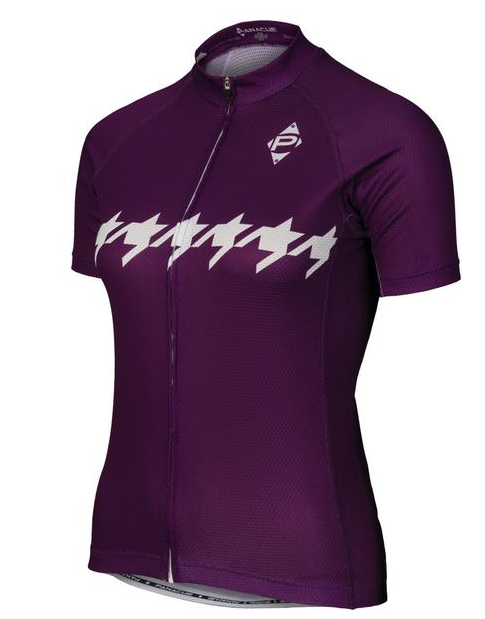 This is a race-cut jersey for sure – you’ll both feel and look fast. All three are available in sizes from XS to XXXL. US$135 For shipping details, see the website. Rapha describes this color combination as Marine Blue/Navy. I describe it as luxuriously gorgeous! I own last year’s Brevet jersey and it’s perfect for those really long rides. This year’s version has the same characteristics. There is plenty of room for food, tools and phone, yet the jersey fits snug and doesn’t feel bulky. It also features a zipped ballast pocket for your gilet. 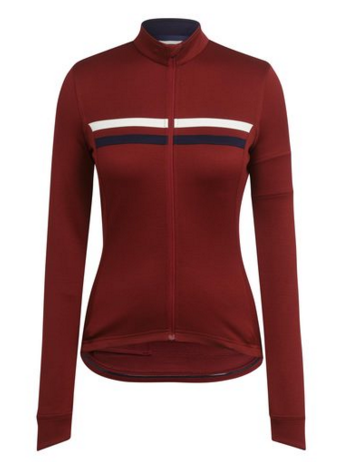 You’ll appreciate the perfect mix of merino wool and polyester. Great feel, great fit. The Brevet is available in sizes from XS to XXL. Men’s short sleeve £130; US$147 ; women’s long sleeve £140; US$154 For shipping details, see the website. I love Tenspeed Hero. They make kit so good looking, you kinda want to lick it. The Resort Sherbet 2.0 is no exception. It’s race fit with taped cuffs and mesh side panels. Made of three different Italian fabrics, it has a luxurious yet fast feel. The horizontal stripe keep you visible! Both men and women’s jerseys are available in sizes from XS to XXL. US$ 150, c.£118 For worldwide shipping details, see the website. All prices are full price (although there are many MANY sales on …) and links are correct at time of going to press. Make sure to review each company’s shipping policies. All of these companies have a variety of products – most also have stylish urban cycling clothes as well as accessories such as snoods and caps, so make sure you have a look at their entire range. If you do buy anything from these companies, let us know what you think of them!